There is great comfort in busy flocks of Chickadees in winter woods. Calling, hopping, curious little flocks of small black and white friends is a rare view of vibrant life in the bleak winter landscape. It seems a miracle they survive the harsh northern New England winter. This winter seemed harsher and longer, and we find greater delight in arrivals of our summer residents, the migratory birds. 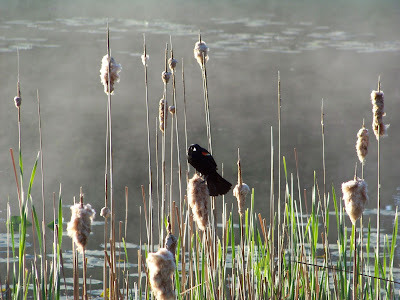 We mark spring by the first calls of Red-winged Blackbirds here, these are followed by Phoebes and other flycatchers. We watch carefully for thrushes, and the first warblers. Yesterday I saw a Loon in Silver Lake State Park. Birds are sneaking back. Everyone in Vermont is itching to get out on trails as soon as snow is melting in the dooryard. It is mud season now, when trails are most fragile and feet make the greatest impact. There are still wonderful safe places to hike to spot some of these early migratory bird arrivals. 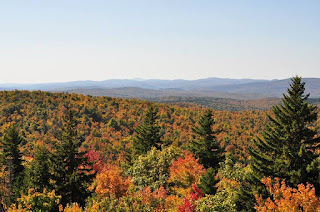 I went to Mount Ascutney State Park recently, I hiked the State Park Parkway which ends near the summit. The views are extensive. I went to observe the changing seasons, to see those precious early signs of spring. I was treated to a long view of endless rolling Vermont landscape tinged in red by flower buds of red maples swelling in the woods below. As I enjoyed that view, and breathed in deeply the smell of wet leaves and thawed ground, I was treated to the view of a new migratory arrival. Below me soaring was a Broad-winged Hawk. The distinctive white and black bars on the tail, and the stout body shape helped me identify the bird. What a thrill it was to watch the hawk soar through trees below me. It was probably looking for some small rodents to eat. I watched it perch for a few minutes in a tall tree, and then it took off again and disappeared into the woods. Broad-winged Hawks are famous for their migrations because they form huge flocks, or kettles, on their way to and from South America. These kettles include thousands of hawks circling together. The hawk I saw started the trip to Vermont with thousands of other Broad-winged Hawks. The hawk just flew 4,350 miles to arrive in its summer home at Mount Ascutney. It flew about 70 miles a day. I’ve been reading a book about a record setting hike on the Appalachian Trial, and I thought a 2,181 mile hike through the woods was impressive. Whether hardiness to survive winter, or lengthy migratory adventures—the birds of Vermont are miracles. 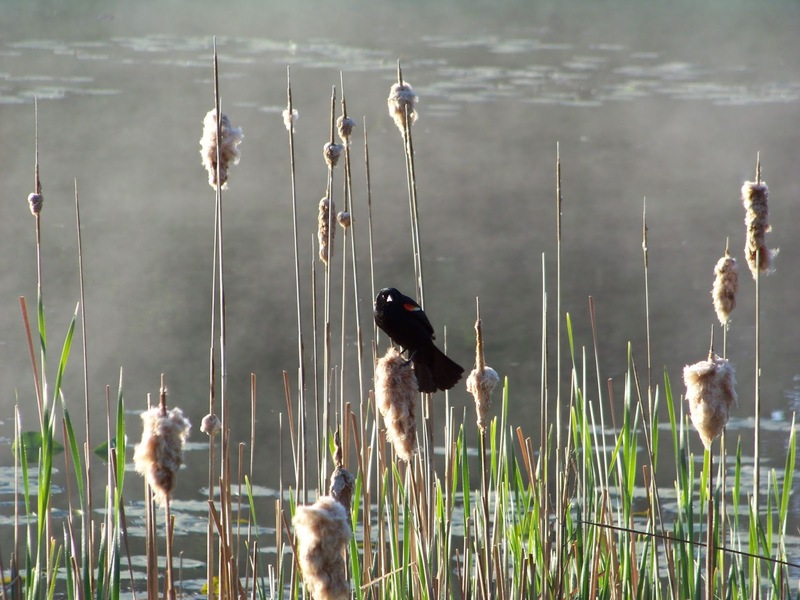 Get out into your favorite state park and make your own observations of changing seasons. The woods are full of pleasant surprises as all the migratory birds are sneaking back. Feel free to let us know what you think. Despite the (shall we say) variable conditions so far this month, it's exactly that time of year to head into the woods and look for growing things! Spring ephemerals are the first flowers you will find in the woods, and favor deciduous hardwood forests. They are usually not large but hardy, and well adapted to withstand cold and variable conditions of early spring. 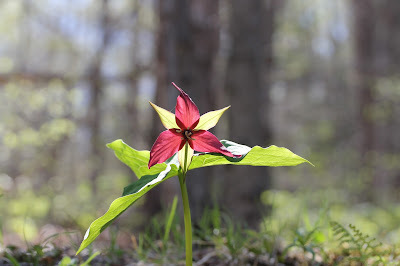 Ephemerals bloom early, often before the snow has completely gone, and complete their life cycle before the trees leaf out, taking full advantage of full sunlight on the forest floor and insulation provided by least years' leaves on the ground. Don't have camping reservations this summer? Not to worry. 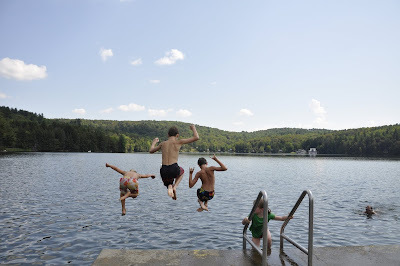 Here are 21 suggestions for park day trips that ought to last you all summer long. Want to get out and enjoy the fall? Everyone loves Camel’s Hump and Mt. Mansfield this time of year, but our other parks trails need love too… and are less crowded. If you’ve experienced Vermont in the fall, you know that it’s hard to go wrong. Here are some suggestions for roads less taken. Also remember to be careful on the roads and when parking on trailheads... respect your surroundings and the folks who live there. If you have another fall hike to recommend, let us know! After you’ve watched the colors of northern VT fade, head south and do it all again! A 1.7 mile hike takes you up Mt. Olga and back again. As a bonus, you can climb the fire tower to get great views of the mountains in three states: Vermont, New Hampshire and Massachusetts. If you want to do more hiking, the park is also adjacent to more trails at Hogback Mountain. You can camp at Molly Stark through Columbus Day weekend.